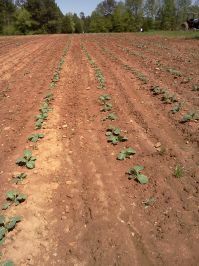 Holliday's Veggie Patch is a family run conventional farm, located in Belton, SC. It is owned and managed by Andy Holliday. Currently the farm consists of approximately 50 acres of cultivated land. During the growing season, our produce can be found all over the Upstate of South Carolina. We sell at the Anderson County Farmer's Market and the TD Saturday Market in beautiful downtown Greenville. As of the 2017 season, the easiest way to get some of our produce is by having a weekly bag through our CSA (Community Supported Agriculture) or seeing us at our produce shed at 1402 Mattison Road in Belton, SC.